Chris and I went to the Down East Wood Ducks game against the Winston-Salem Dash today to try to get some more autographs. We did really well today, getting bunch of autos from the Dash, as well as the Wood Ducks. The above 2011 Topps cognac parallel turned out really nice. I had been hoarding Harris cards for TTM, but I was able to get everything that I had signed, which helped out tremendously. Harris (b. 1978) was really nice to Chris and I. He signed everything that we had, and then Chris gave me all but one of the cards that he had gotten signed. I had bought all of his Orioles cards off of COMC, since I wanted to add them to the collection. 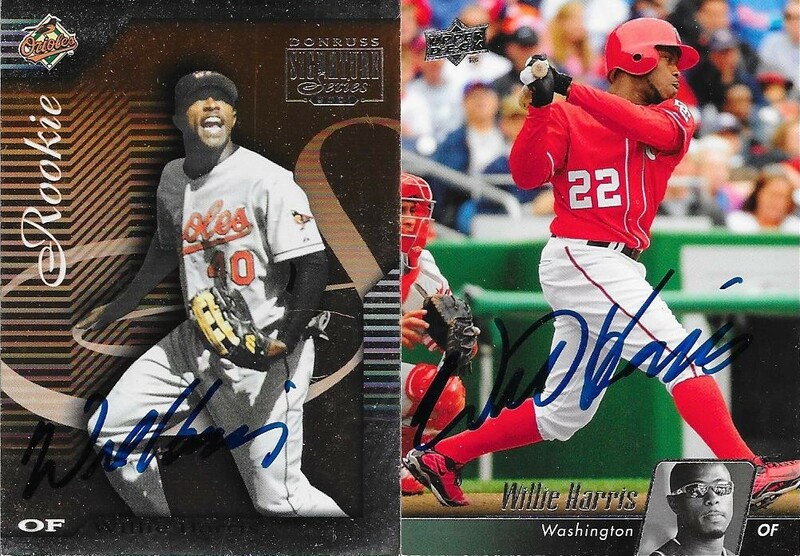 Harris played in the majors from 2001 to 2012 for the Orioles, White Sox, Red Sox, Braves, Nationals, Mets and Reds. He had 580 hits, 39 home runs and a .238 batting average in his career. He won the World Series in 2005 with the White Sox. Brian Drahman was really nice. He also signed everything that Chris and I had. I had found 5 1992 Topps of his between my boxes and the ones at my LCS. Drahman (b. 1966) played in the majors from 1991 to 1994 for the White Sox and Marlins. He had a career record of 3-2 with 29 strike outs and a 3.54 ERA. I had two cards of prospect, Zack Collins. 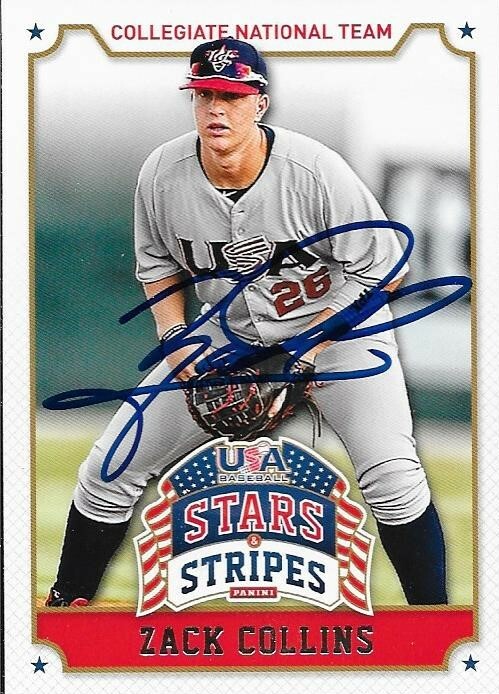 He would only sign one, but this 2015 Stars and Stripes turned out really nice. I busted a jumbo box of 2017 Bowman yesterday and took a few cards from it to the game today. 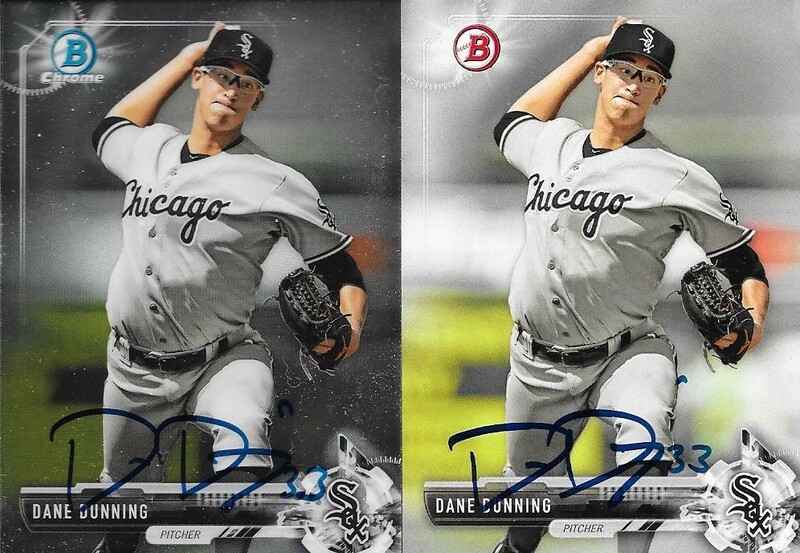 I was successful in getting all of them signed, starting with these two (a chome and paper) from Dane Dunning. He was the only player that I got after the game. The Dash won 6-1, but Dunning was really the only guy I had left that I could get. 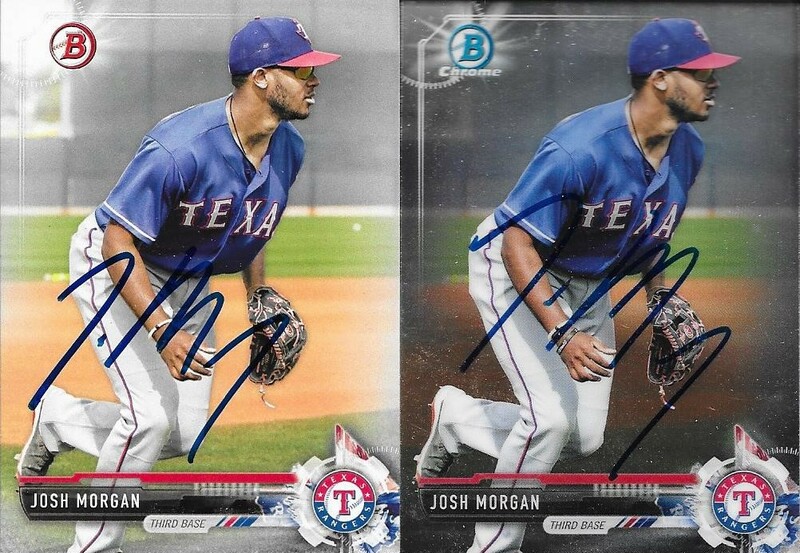 I was pleasantly surprised to see Josh Morgan show up in my 2017 Bowman box. He signed both cards for me, but was off from the game today. It was just a routine day off. He was still nice enough to sign. 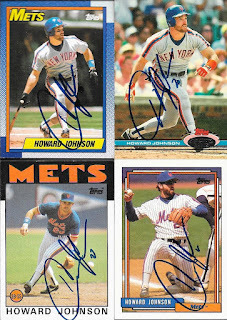 Between Chris and I, we got four Howard Johnson cards signed. I still have a ton of his cards, but he has been really nice and has signed for us each time. Johnson (b. 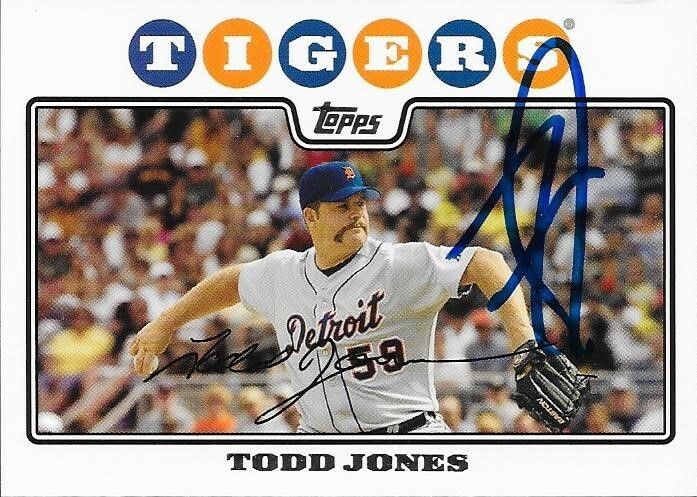 1960) played in the majors from 1982 to 1995 for the Tigers, Mets and Rockies. He had 1,229 hits, 228 home runs and a .249 batting average. He was a two-time All Star and Silver Slugger (1989 and 1991) and his best finish in the MVP Award voting occurred in both of those seasons, with a fifth place finish. He won the World Series with the Tigers in 1984 and the Mets in 1986. He appeared on the Hall of Fame ballot in 2001, but didn't receive any votes. Finally, I got another of my Hickory Crawdads cards signed, this one by Chuck Moorman. A lot of this year's Wood Ducks were Crawdads last year, so I have gotten a few of the cards signed. Chris and I did really well at this game, I think. I am low on Wood Ducks cards, so I think I will be trying to refill at some point soon. I was able to add a few more recent cards to my autograph album with this success from former pitcher, Todd Jones. 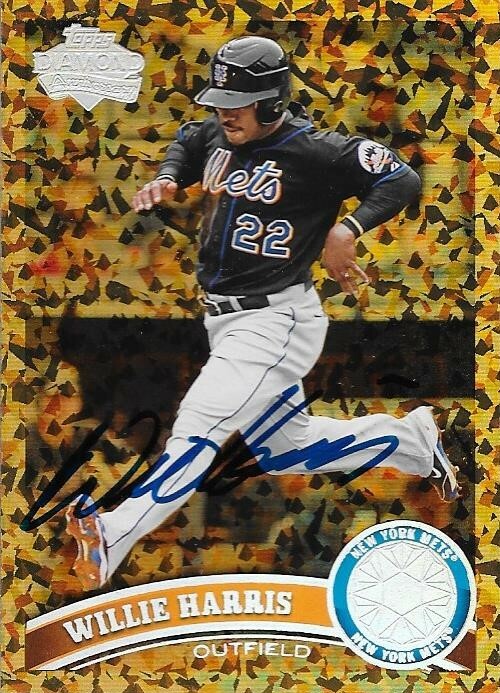 The above 2008 Topps was a nice one to get, since it is a horizontal card. I didn't mind these cards when they came out, but the over-sized border does take away from the photo, somewhat. I got a few really nice cards in the success, starting with the celebratory pose on the 2000 chrome Stadium Club. It didn't scan all tha great, but it looks better in person. The baby powder really helped that card out. 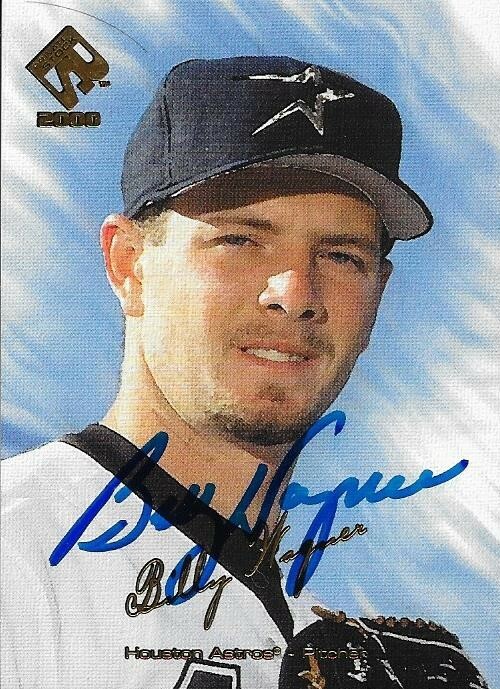 The 2001 Topps Heritage turned out really nice, as well. The other two cards are a 1996 Fleer and a 1992 Upper Deck Minors. 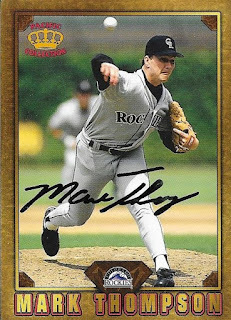 I always enjoy the 1996 and 1997 Fleer, due to their Matte finish. 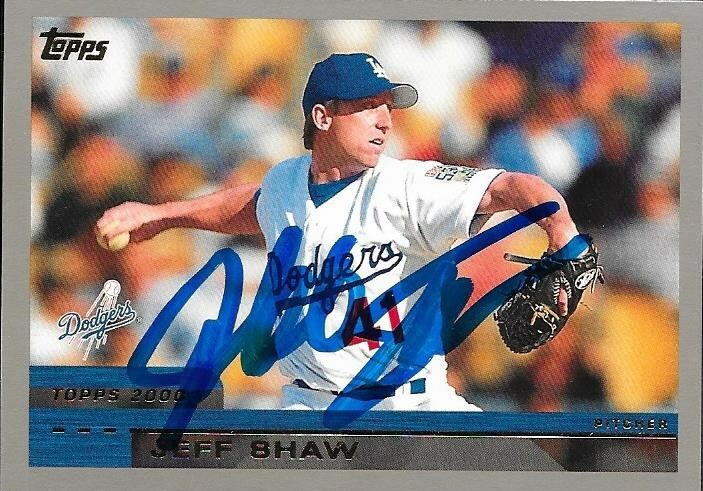 I also added this nice 2002 Topps. I didn't have a whole lot of these in the album, so anything additional is a bonus. Jones (b. 1968) played in the majors from 1993 to 2008 for the Astros, Tigers, Twins, Rockies, Red Sox, Reds, Phillies and Marlins. 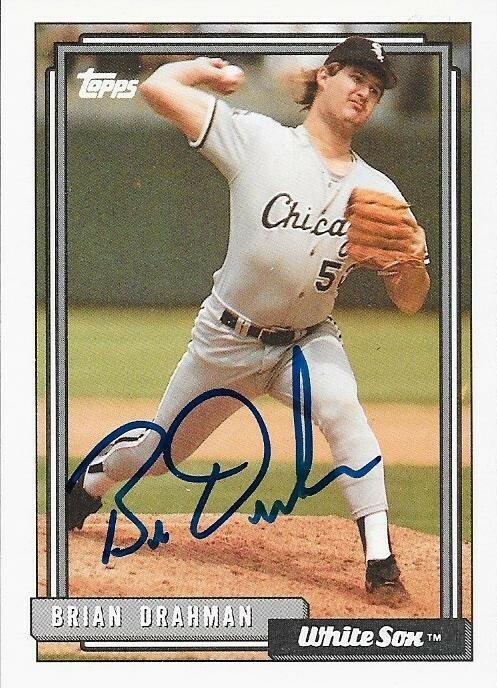 He had a career record of 58-63 with 868 strike outs and a 3.97 ERA. His 319 saves rank 19th all-time. 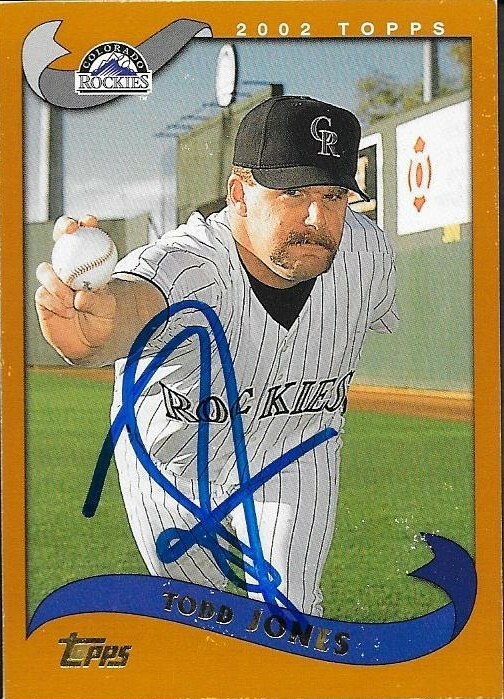 He was an All Star in 2000 and finished 5th in the AL Cy Young Award voting, his only appearance on that ballot. He was on the 2014 Hall of Fame ballot, but didn't receive any votes. I mailed to Jones on February 27 and got the cards back on April 10, for a 42-day TAT. 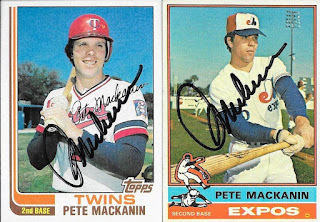 I got a couple nice Topps cards signed by Pete Mackanin recently. He signed two 1976 Topps and the the 1982 for me. 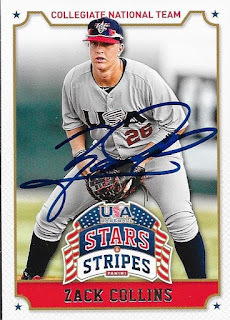 He has a pretty nice signature, and the cards turned out really nice. Mackanin (b. 1951) played in the majors from 1973 to 1981 for the Rangers, Expos, Phillies and Twins. He had 355 hits, 30 home runs and a .226 batting average. Mackanin managed the Pirates for 26 games in 2005 to a record of 12-14, then managed the Reds in 2007 to a record of 41-39. He, then was named the Phillies manager after Ryne Sandberg left and has managed them ever since. His record with the Phillies is 119-152. His overall managerial record is 172-205. I mailed to Mackanin on February 21 and got the cards back on April 7, for a 45-day TAT. I don't have many cards at all from the late 90s and early 2000s, so when I got this success from Jeff Shaw, I was pretty happy. 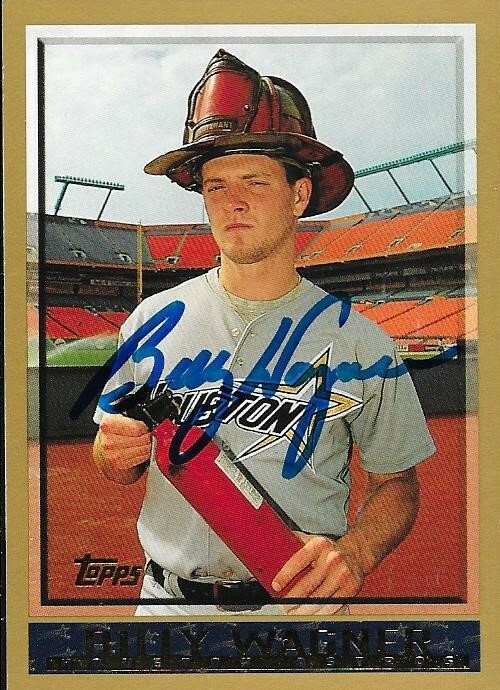 I have no clue where I picked up this 2000 Topps unless it was on the stack of like 5 cards I have from that set. It's a nice looking set, so I need to add more of them o my collection. It all starts with finding some and picking them up. I picked up the 1999 Finest frmo my LCS. I like how the card turned out, even though the auo is hard to see in the scan. The 1998 Topps came from the huge lot my mom picked up a while back. Shaw (b. 1966) played in the majors from 1990 to 2001 for the Indians, Expos, White Sox, Reds and Dodgers. He had a career record of 34-54 with 545 strike outs and an ERA of 3.54. He was an All Star twice (1998 and 2001). 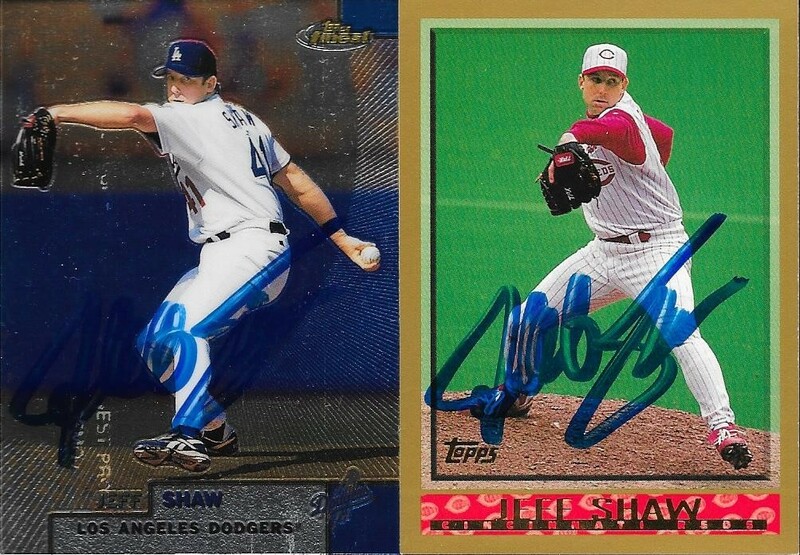 I mailed to Shaw on March 28 and got the cards back on April 6, for a 9-day TAT. 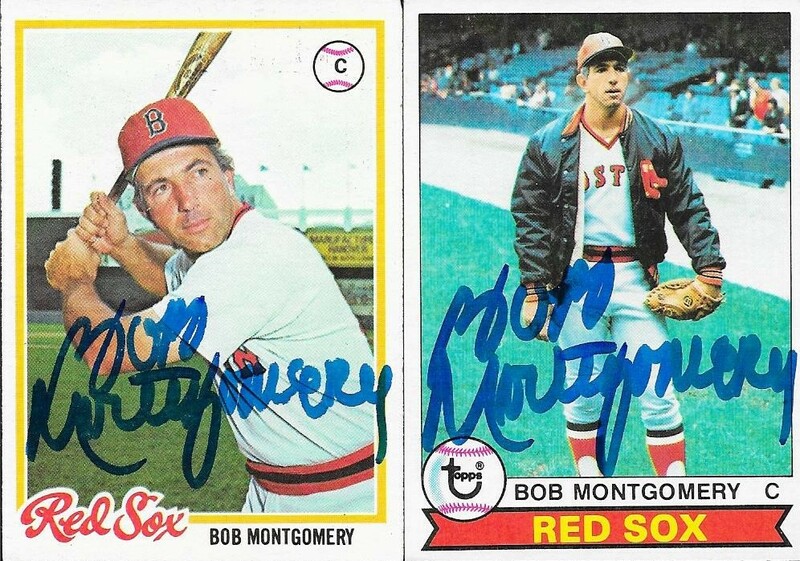 I added some more 1970s cards to my autograph album with this success from Bob Montgomery. 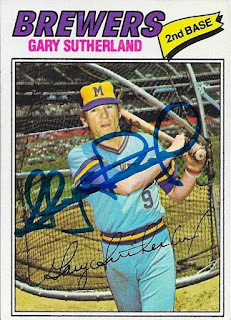 I can't remember where I found this beat up 1974 Topps, but since I needed more in the album, I had no problem sending it away for an auto. 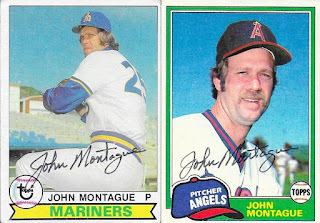 These two cards (1978 and 1979 Topps) came out of a box of cards that I bought at the February card show in Raleigh. Montgomery (b. 1944) played in the majors from 1970 to 1979 for the Red Sox. He had 306 hits, 23 home runs and a .258 batting average. I mailed to Montgomery on March 27 and got the cards back on April 6, for a 10-day TAT. 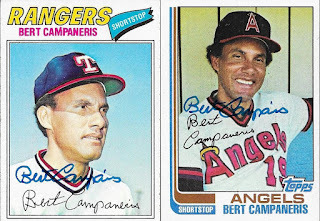 I was able to get another of the 1976 Hostess cards that Max gave me signed with this success from Bert Campaneris. The card was in a huge lot of cards that Max had sent long back when we first started trading. I'm always happy to take a card out of that pile and add it to the autograph album. I also sent away this 1977 Topps, and this 1982 Topps. They both turned out really nice, especially the 1977. It just comes off as a really clean, sharp card. 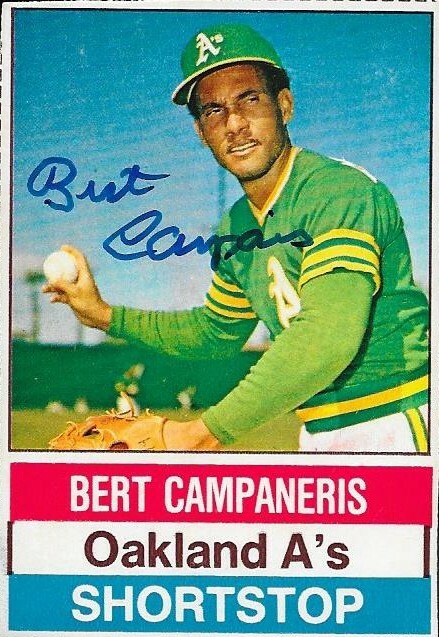 Campaneris (b. 1942) played in the majors from 1964 to 1981 and 1983 for the Kansas City and Oakland A's, Rangers, Angels and Yankees. He had 2,249 hits, 79 home runs and a .259 batting average. 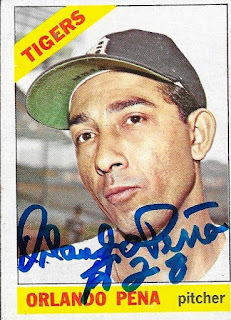 He was a 6-time All Star (1968, 1972 to 1975 and 1977) and finished in the MVP voting 8 times with a best finish of 10th in 1966. His 649 career stolen bases rank 14th all-time. 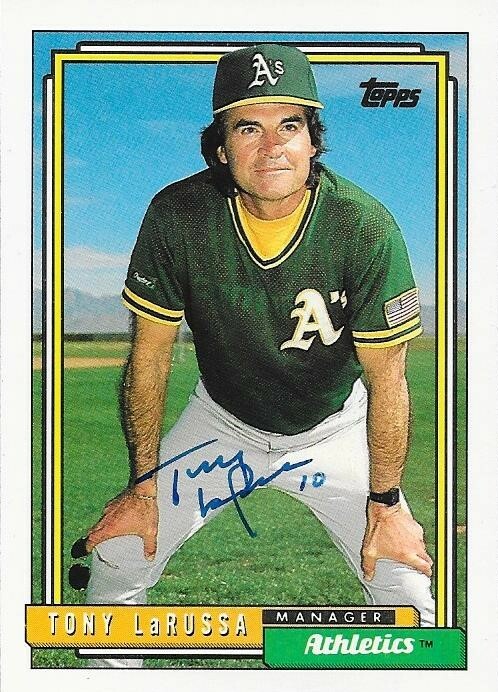 He won the World Series with the A's in 1972, 1973 and 1974. 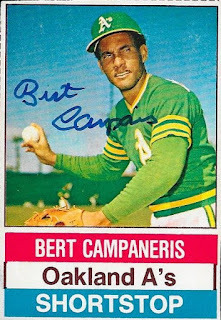 I mailed to Campaneris on January 11 and got the cards back on April 5, for an 84-day TAT. 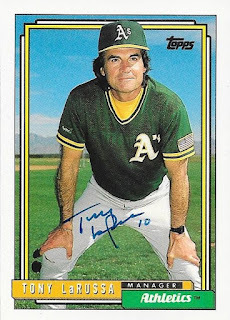 I had to mail to Tony LaRussa again so I could get him on a 1987 Topps card. He did sign an 87 for me, but I actually had sent two. 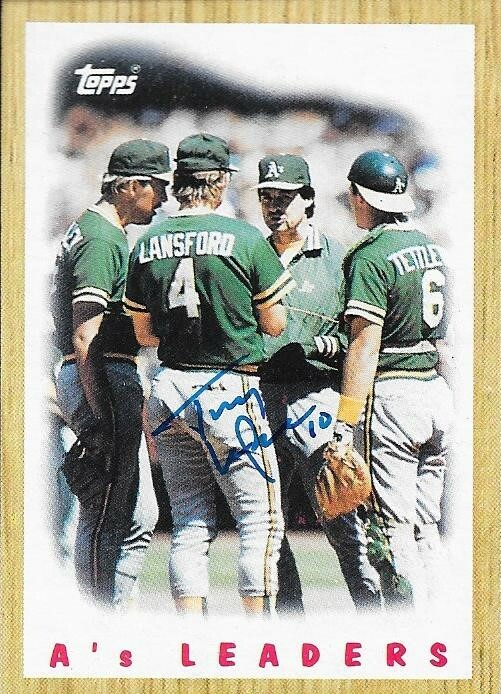 He left the 1987 Topps base card unsigned and signed this 1987 Topps A's Team Leaders. I'm ok with that, I can always try again at a later date (maybe Spring Training next year). He also signed this 1992 Topps that turned out really nice. 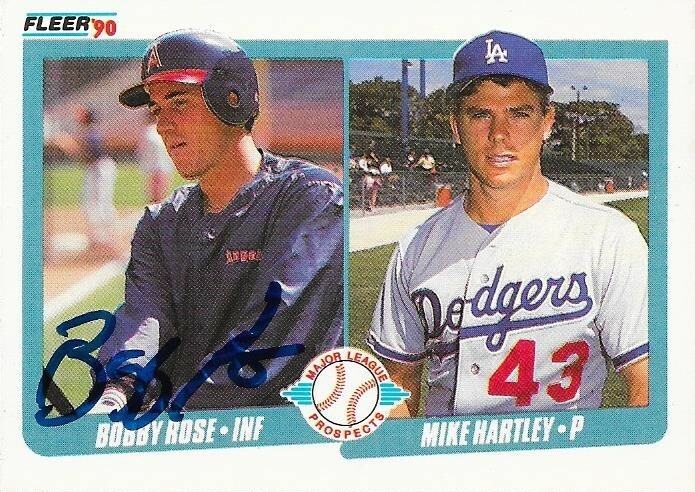 I had several cards to choose from, but went with this, and those two 1987s. Getting two of the three signed really isn't too bad at all. 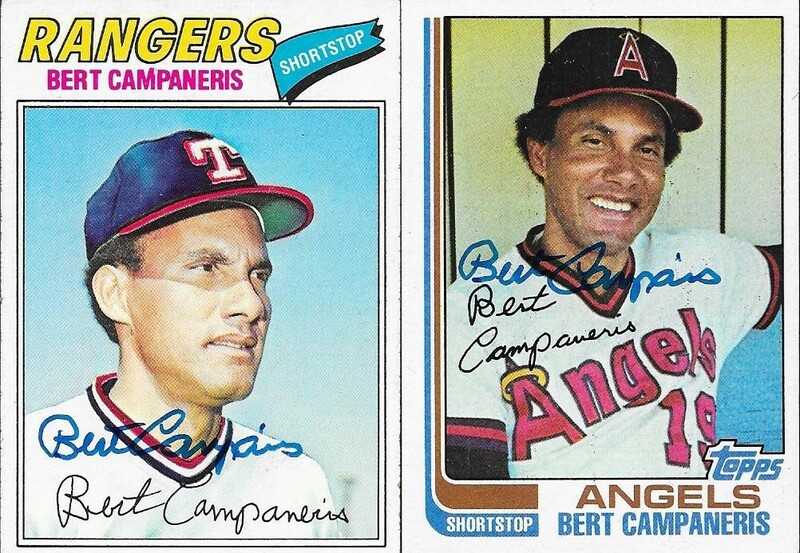 I mailed to LaRussa on February 22 and got the cards back on April 5, for a 42-day TAT. I got a really cool TTM success from former closer Billy Wagner recently. 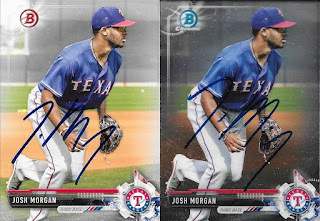 I had seen that he was signing, but I was still surprised when these cards came back signed. The above 1998 Topps was the cards I really wanted to add to the album. That set is really underrated, and has some nice shots of players on some of the cards. Take a look at the Vladimir Guerrero card in the 1998 Topps set, and you will see what I mean. I used the request to Wagner to be able to add a couple years of Topps that I had very few of to my album. I can't remember the last time I was able to add a 2000 Topps. It turned out that I sent a few of them out all at once, though, due to there being several subjects in the boxes at my LCS. 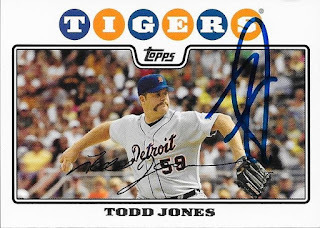 I also added a 2008 Topps, which is no longer the set I have the fewest of in the Topps Autograph Project (2001 and 2009 are really lacking at this point). 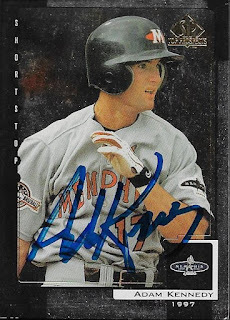 Finally, this 2000 Pacific Private Stock was a nice card to get signed. I had a few cards from this set in my collection, but none of them signed. Wagner (b. 1971) played in the majors from 1995 to 2010 for the Astros, Phillies, Mets, Red SOx and Braves. He had a career record of 47-40 with 1,196 strike outs and an ERA of 2.31. His 422 saves are 6th all-time. He was a 7-time All Star (1999, 2001, 2003, 2005, 2007, 2008 and 2010). His best finishes for the Cy Young Award (4th) and NL MVP (16th) both came during the 1999 season where he went 4-1 with a 1.57 ERA and 39 saves. Wagner has appeared on two Hall of Fame ballots (2016 - 10.0%; 2017 - 10.2%) and many sports commentators feel he has a strong case to receive more votes over time when the glut of names on the ballot is reduced somewhat. 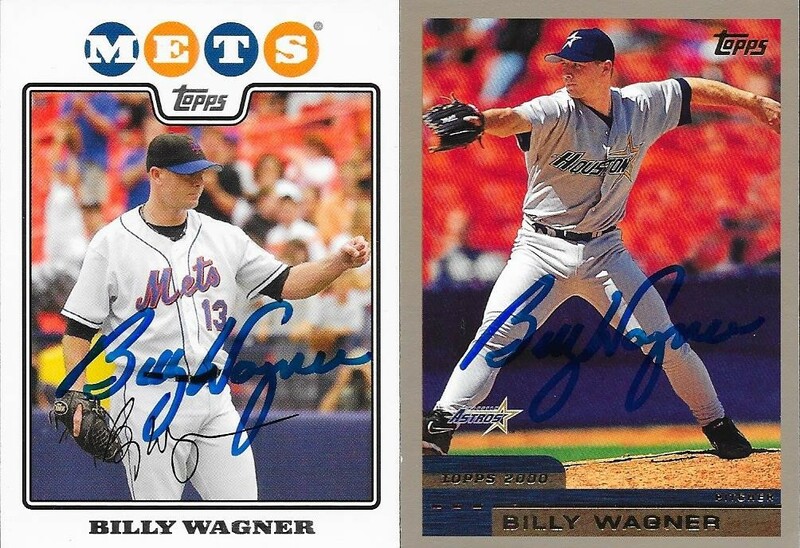 I mailed to Wagner on March 20 and got the cards back on April 5, for a 16-day TAT. 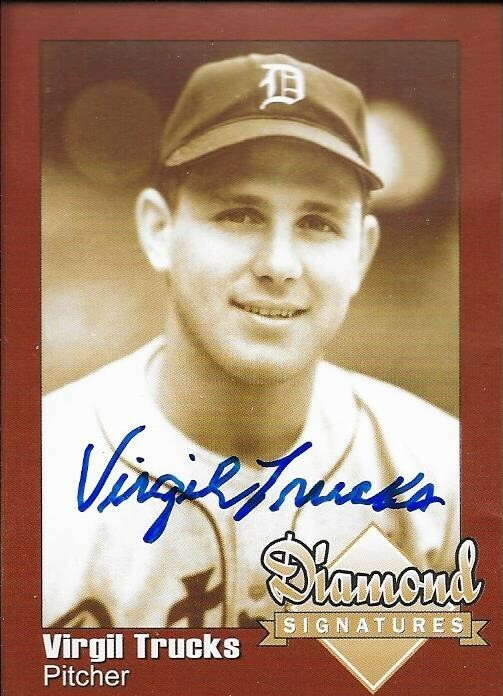 Even though he passed away in March of 2013, not a day goes by that I don't think about Virgil Trucks. He was a really good man; one of the best former players to interact with fans. He afforded me the opportunity to interview him over the phone, which you can read here. I am doing a giveaway on my Instagram (follow me @wregenthal) in honor of his 100th birthday. He always gave to me, so I want to give to someone else. Also, I encourage you to check out my Virgil Trucks collection, here. Trucks was born on this day in 1917 and passed away on March 23, 2013, at the age of 95. I enjoyed writing to him and receiving letters back. He truly was one of the best. While Chris was out of town for Easter break, my wife and I were able to catch a game at Historic Grainger Stadium on Thursday, April 20. Before the game, my wife and I did a little graphing. 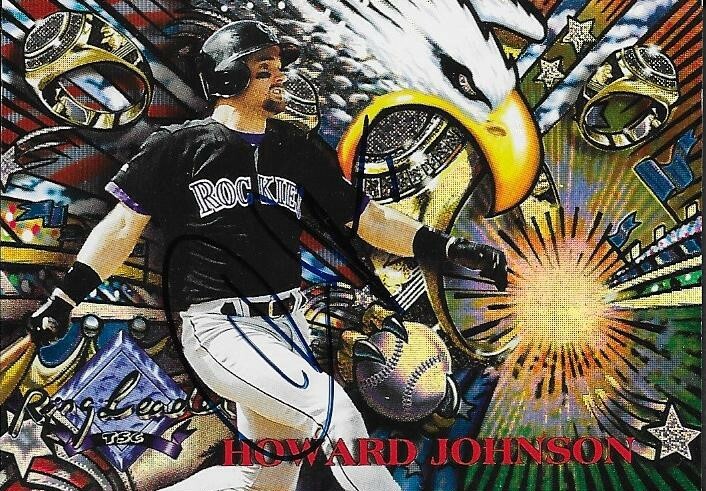 I got Howard Johnson on two cards (one of which was a 50/50 for my buddy, Carson). My wife actually got this 1995 Stadium Club Ring Leaders card signed for me (the auto is by his hip). I also did some 50/50 graphing for my good friend, Max. 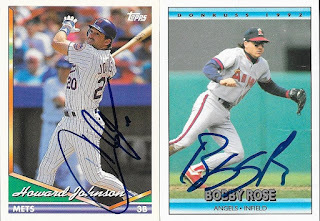 He sent me a few Bobby Rose cards, and I got them all signed, and split them with him. The Howard Johnson that I got signed for Carson was a 1987 Fleer, which looked really nice in blue Sharpie. The Rose was another from Max. 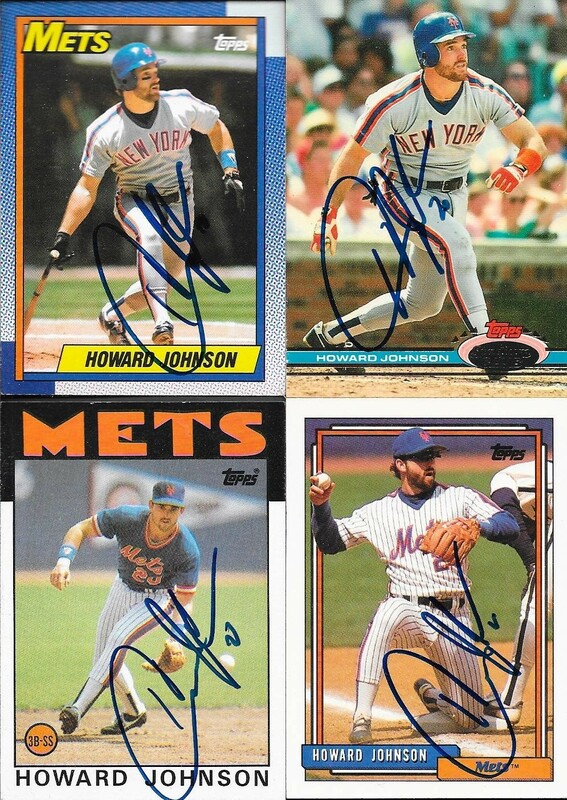 I was also able to get the above 1994 Topps Howard Johnson signed. I think I have gotten just about everything that I had of Johnson that I really wanted to get signed. I think most of what I get after this will probably be gifts for friends and/or trade bait. 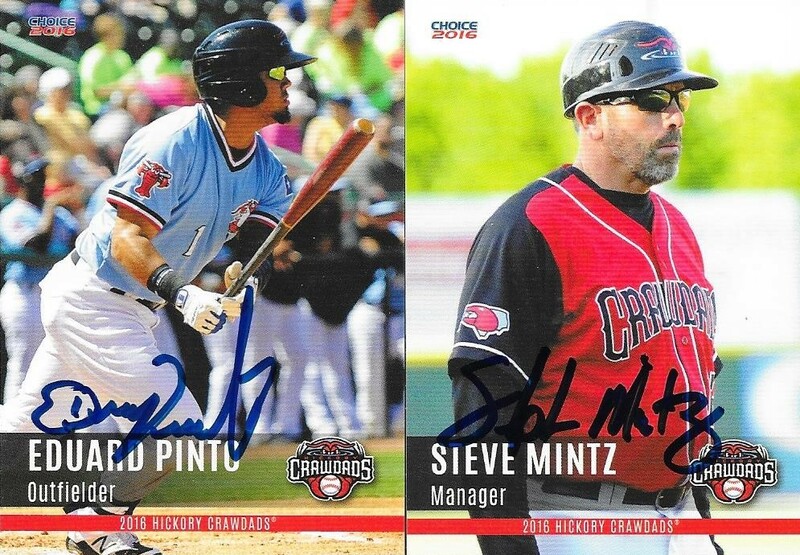 We were also able to get a few of the Hickory Crawdads team set cards signed. A lot of the players in this set have moved up to the Wood Ducks this season. Steve Mintz went to nearby Mount Olive College, and is now the Wood Ducks pitching coach. The Wood Ducks lost the game, but we had to leave early, since my wife had to be up really early for work. It was nice to go out and spend some time at a game with her, though. I know the ballpark isn't her ideal spot, but we seem to enjoy going to games together. Now that Chris is home, though, he and I will be doing some more graphing, I'm sure. 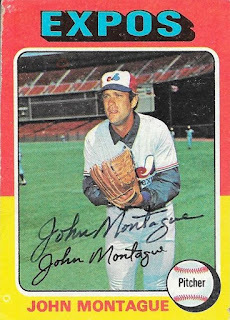 I added some more 1970s cards (and an 81) to the autograph album with this success from John Montague. I'm always happy to add 1975 Topps to the album, especially ones that came from my very good friend, Max. His birthday is tomorrow, in case anyone wanted to wish him a happy birthday (Max, not Montague). I have been adding more and more 1979 Topps to the autograph album, which is nice. At one time, I had no extras of 1979, but thanks to the February card show, I got some in bulk. The 1981 set is always nice to add. I have a ton of them to get signed, still, so I hope to keep adding more. Montague (b. 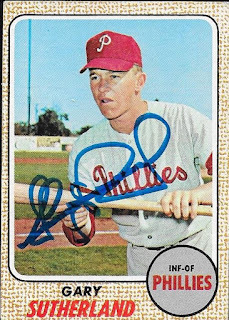 1947) played in the majors from 1973 to 1975 and 1977 to 1980 for the Expos, Phillies, Mariners and Angels. He had a career record of 24-26 with an ERA of 4.76 and 260 strike outs. I mailed to Montague on February 24, and got the cards back on April 4, for a 39-day TAT. This was a really nice success from former pitcher, Orlando Pena. I was able to get him to sign the above 1966 Topps and the 1974 and 1975 Topps cards below. He also wrote a nice note in return with my cards. Pena (b. 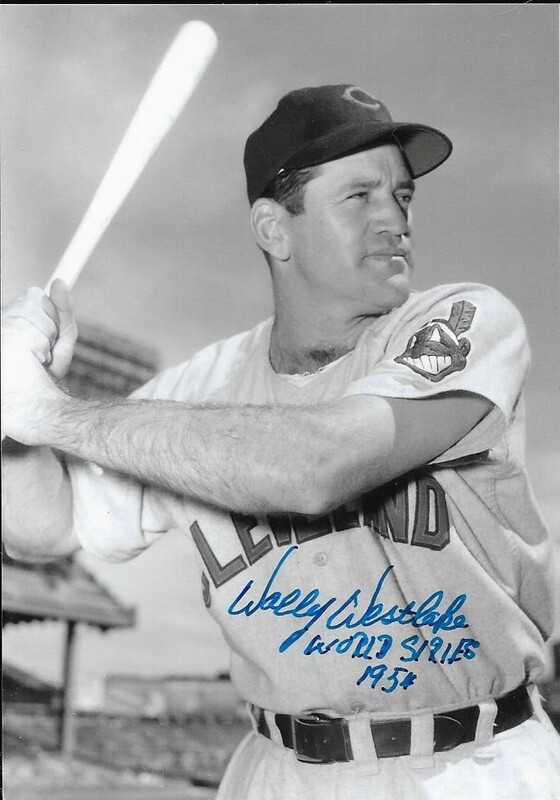 1933) played in the majors from 1958 to 1960, 1962 to 1967, 1970, 1971 and 1973 to 1975 for the Reds, A's (Kansas City), Tigers, Indians, Pirates, Orioles, Cardinals and Angels. He had a record of 56-77 with an ERA of 3.71 and 818 strike outs. 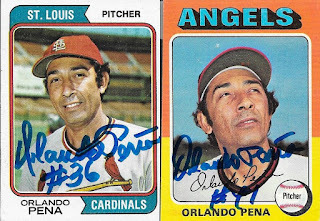 I mailed to Pena on March 17 and got the cards back on April 3, for a 17-day TAT. 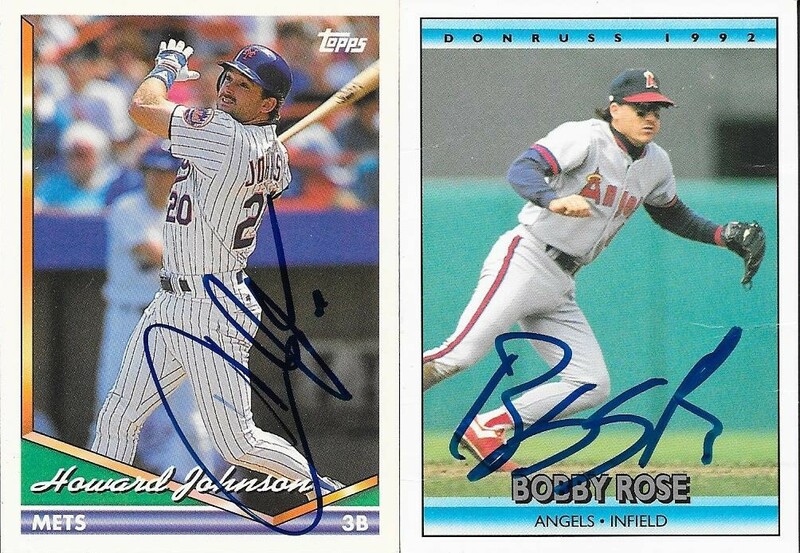 I continue to whittle my "to be blogged" stack of TTM successes down. I have actually slowed down on sending out requests since the season has started. Still, I have a lot more to post, and a lot more still out in the world, waiting to be sent back. 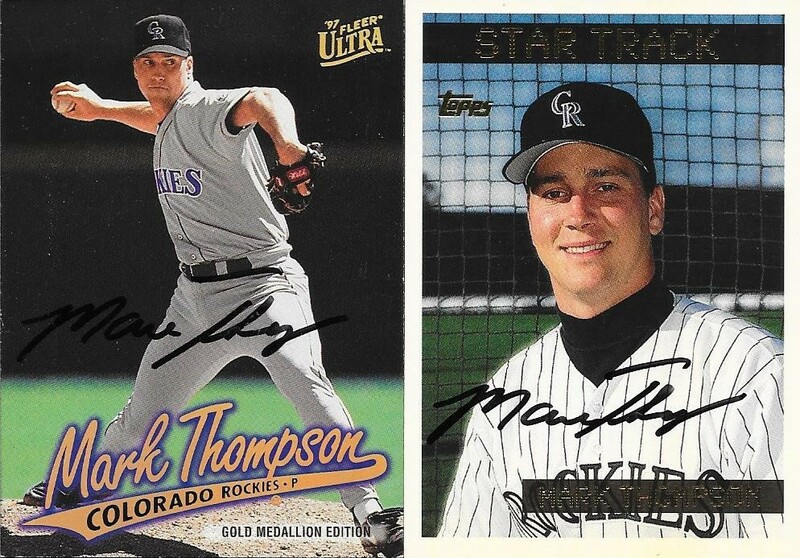 I got a few nice cards signed by Mark Thompson recently. The above 1997 Pacific was a card that I had floating around in my random card box for a long time. I finally was able to take it and transfer it to the autograph album with this success. 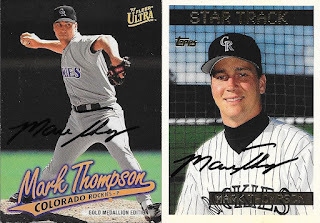 The 1997 Fleer Ultra came from one of the boxes that Mom found for me, and the 1995 Topps came out of the hobby box that I bought to push my set along. Thompson (b. 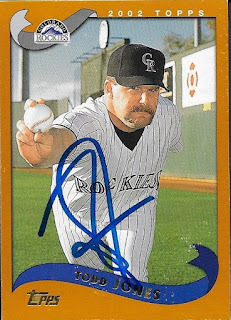 1971) played in the majors from 1994 to 2000 for the Rockies and Cardinals. He had a record of 18-24 with an ERA of 5.74 and 198 strike outs. I mailed to Thompson on November 15 and got the cards back on April 3, for a 139-day TAT. I was able to add some nice 1990s cards to my autograph album with this success from Kevin Orie. 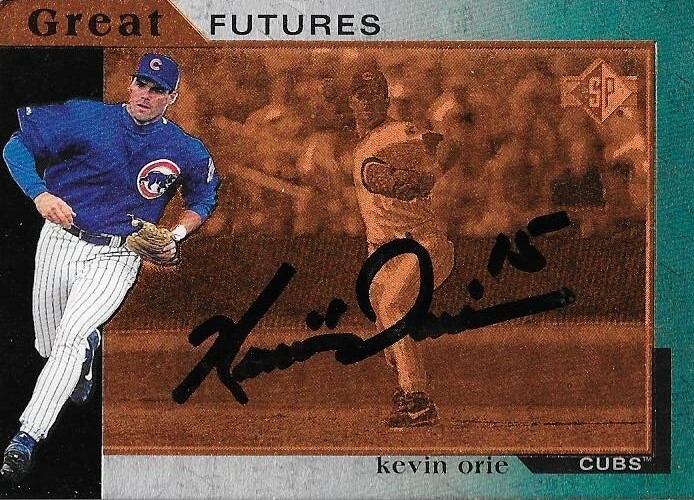 I had waited a while to send to Orie, and built a nice cache of cards up to send out. I was most excited about this 1997 UD SP Great Futures card, and it didn't disappoint. 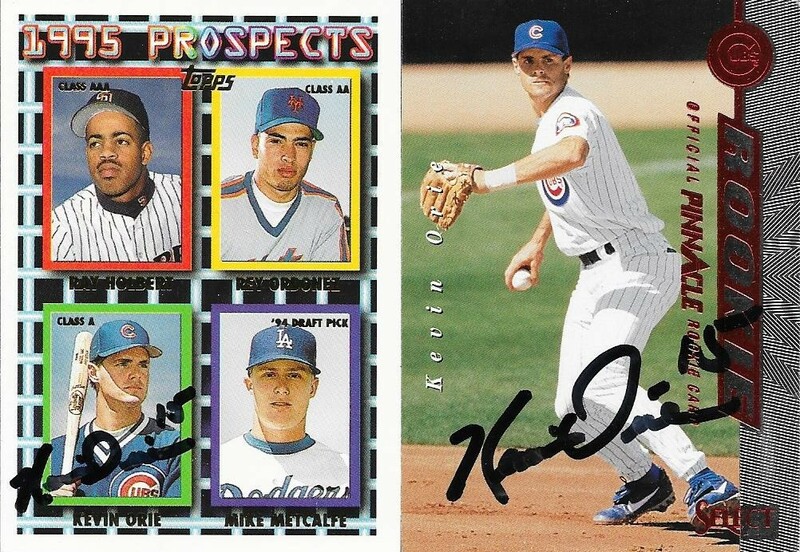 I was also able to get him on a 1995 Topps, and the above 1997 Select. I don't think I will be working on the rest of the guys on the 1995 Topps, but that always remains a possibility. 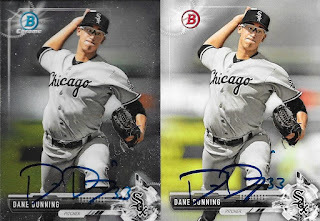 I capped off the success with a couple other nice horizontal cards. I liked the 1997 Pinnacle XPress card. Orie (b. 1972) played in the majors from 1997 to 1999 and 2002 for the Cubs and Marlins. He had 253 hits, 22 home runs and a .249 batting average. 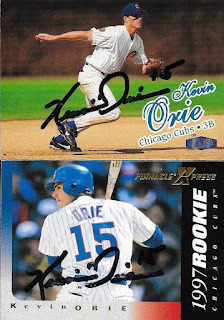 I mailed to Orie on January 24 and got the cards back on April 3, for a 69-day TAT. I added another 1953 Bowman Color to my autograph album with this success from Larry Miggins. The card was purchased from Ebay. I sent to Miggins on March 14 and got the card back on April 3, for a 20-day TAT. Miggins (b. 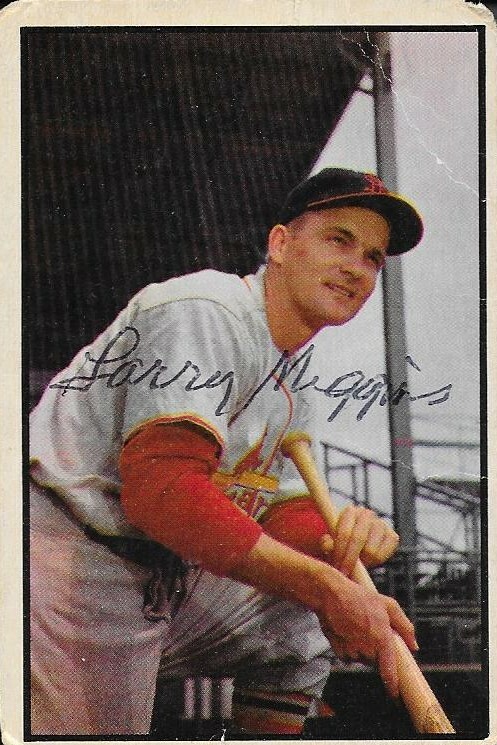 1925) played in the majors in 1948 and 1952 for the Cardinals. He had 22 hits, 2 home runs and a .227 batting average. 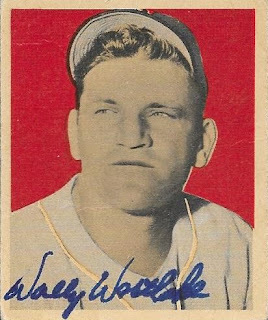 He was selected off of waivers from the Cardinals by the Cubs on April 17, 1948, only to be selected off of waivers by the Cardinals from the Cubs on April 23, 1948. 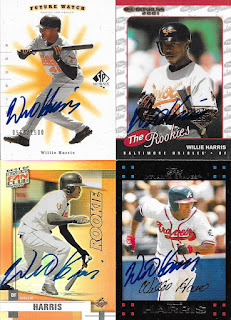 Here is a really cool TTM success that was populated almost solely from the "boxes in the back" of the card shop. There are two Topps cards that were mine, but the rest of the cards were ones I wasn't around to see when they first came out. The above 2000 Topps Finest was the one I was most excited about seeing come back. It turned out really nice, and scanned pretty well. 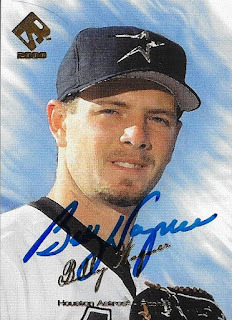 this 2000 UD SP Minors is pretty cool. 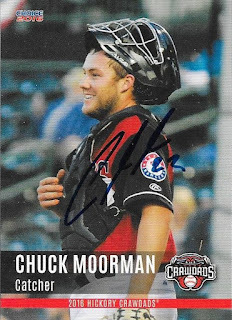 They had a bunch of these cards in the back, and I found a few good ones of some TTM guys, so I'm hoping a few more of them come in. Kennedy's Sharpie looks like it was about to die, but I still got a few other nice cards signed. 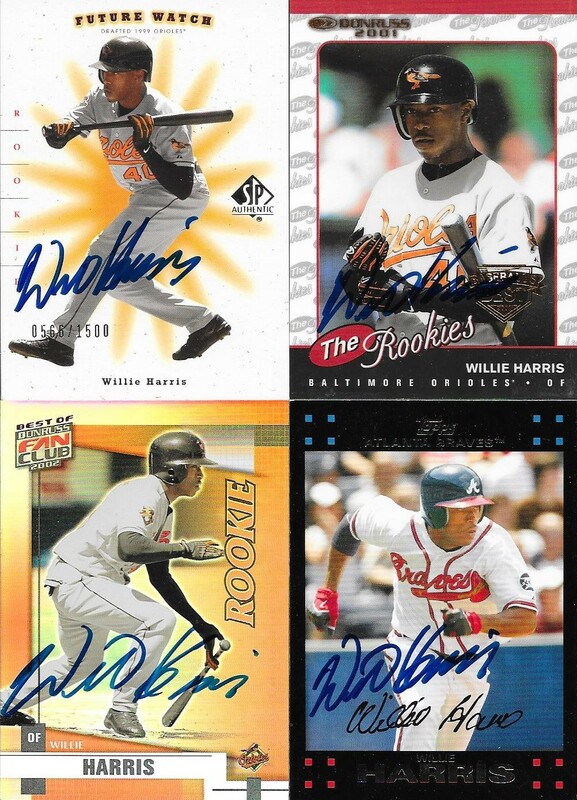 I even was able to add a few ticks to the Topps Autograph Project, as well with the 2005 and 2007 Topps. Those two sets are pretty low in the rankings in the project, at 8 cards for 2005 and 4 for 2007. Kennedy (b. 1976) played in the majors from 1999 to 2012 for the Cardinals, Angels, A's, Nationals, Mariners, and Dodgers. 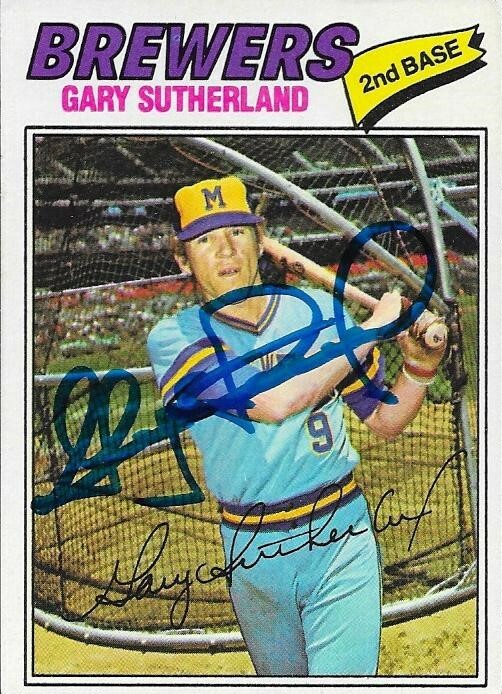 He had 1,488 hits, 80 home runs and a .272 batting average. He was the 2002 ALCS MVP and won the World Series with the Angels in 2002. 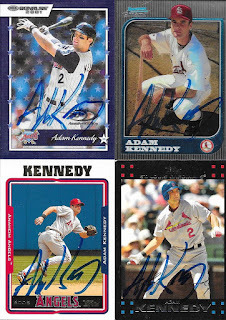 I mailed to Kennedy on March 20 and got the cards back on April 3, for a 14-day TAT. 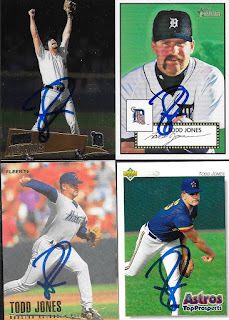 This was a pretty awesome TTM success that I was really excited to get to post tonight. I have been waiting patiently for a while, and I have finally come to it in my queue of TTMs to be posted. 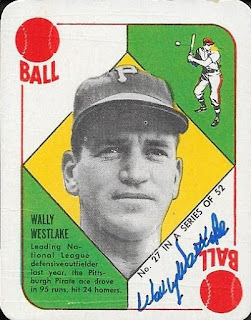 I picked up two much needed vintage cards for the album in these Wally Westlake cards. The above is only my second 1951 Topps Red Back autograph. It turned out great, and Westlake has a great signature for his age. This is my second signed 1949 Bowman, the other was the Bobby Brown auto. This one really pops with the red background. It was a decently cheap card when I picked it up, so I was happy to be able to get it out and get it signed. Westlake also answered my questions, one of which was "Who was your favorite player when you were growing up?" His response? Babe Ruth. Westlake really surprised me, not only by signing the letter I sent, but also for sending along two signed and inscribed photos. They're real photos, not cheap prints, or post cards. I thought it was a really awesome gesture. Westlake (b. 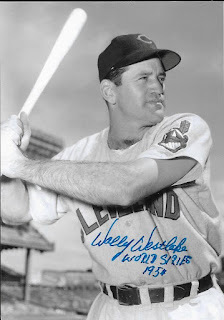 1920) made his major-league debut on April 15, 1947. Let that sink in for just a second. His major league debut was 70 years ago, at the age of 26. He is now 96, and is still signing autographs for fans. He played in the majors from 1947 to 1956 for the Pirates, Cardinals, Reds, Indians, Orioles and Phillies. He had 848 hits, 127 home runs and a .272 batting average. 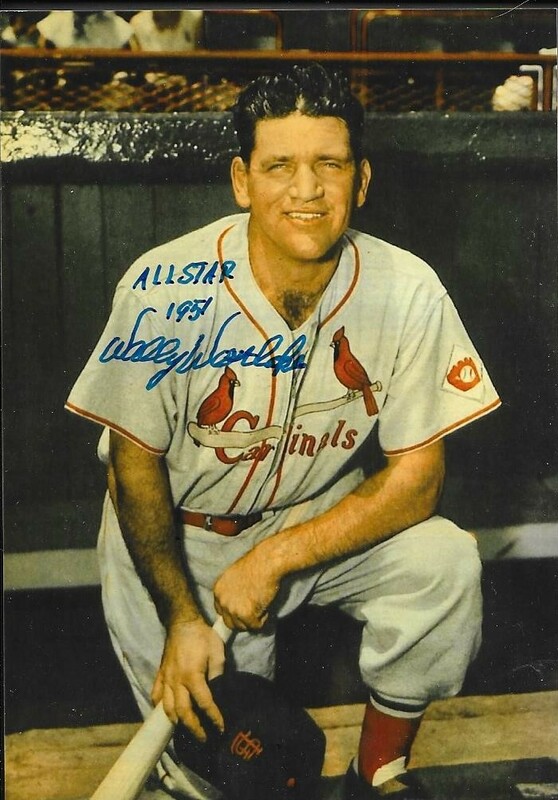 He was an All Star in 1951 and appeared in the 1954 World Series. His Indians lost to the New York Giants in a 4-game sweep. His time with the Orioles was brief, he appeared in 8 games for the O's after being traded from Cleveland and before being moved again to the Phillies. I mailed to Westlake on March 14 and got the cards back on April 3, for a 20-day TAT. 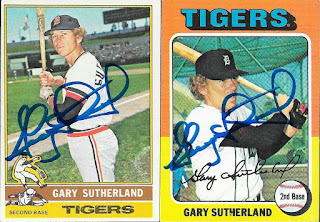 Here is a TTM success from Gary Sutherland on some 60s and 70s Topps cards. The above 1968 Topps was one of the cards that I raided from my vintage box. 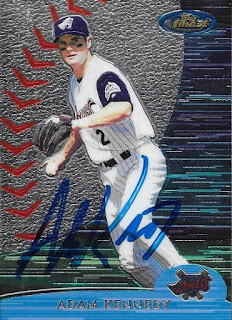 The autograph turned out really nice on this card, I think. I added these cards from 1975, 1976 (above) and 1977 (below) via some boxes from the Columbia antique shop and the February card show. 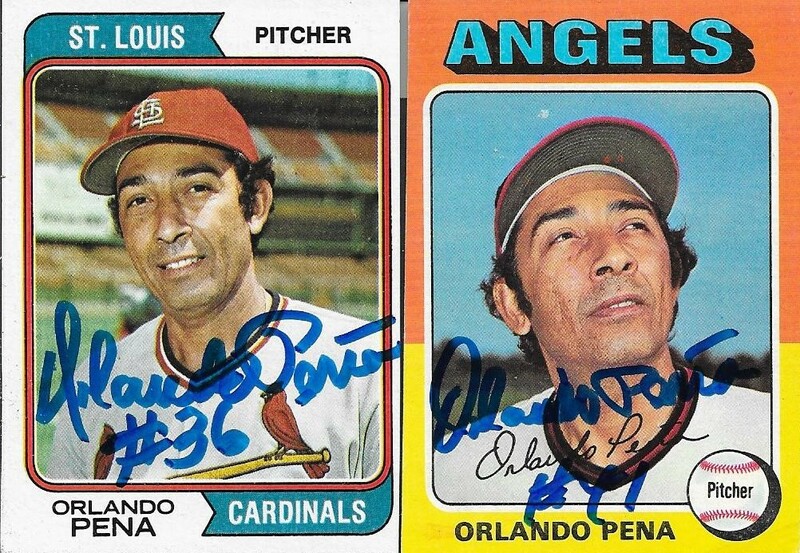 I have a bunch of mid-70s cards signed, with 1975 in the lead with 29. 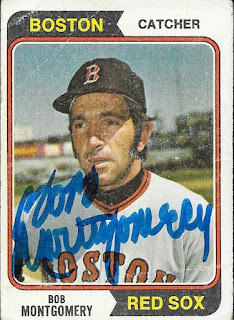 I have 21 signed 1976 Topps and 23 signed 1977 Topps. Sutherland (b. 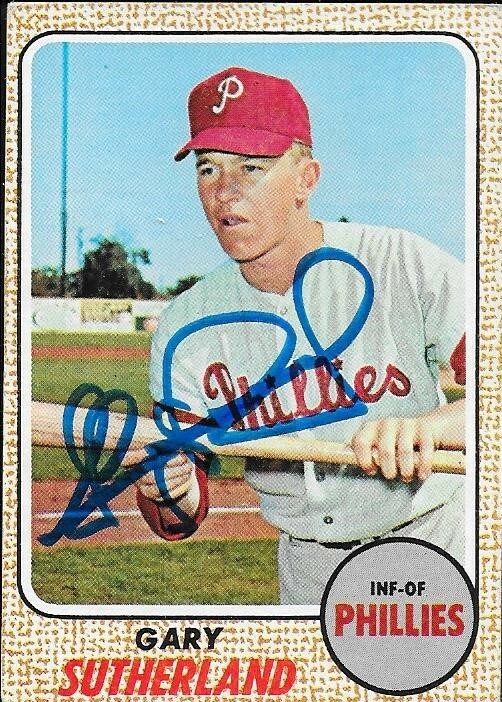 1944) played in the majors from 1966 to 1978 for the Phillies, Expos, Astros, Tigers, Brewers, Padres and Cardinals. He had 754 hits, 24 home runs and a .243 batting average. I mailed to Sutherland on March 23 and got the cards back on April 1, for a 9-day TAT. Here is a TTM success from Paul Reuschel that I had come in a couple weeks ago. I only had a few cards of him, and went ahead and sent them out. This 1979 Topps turned out really nice, I think. 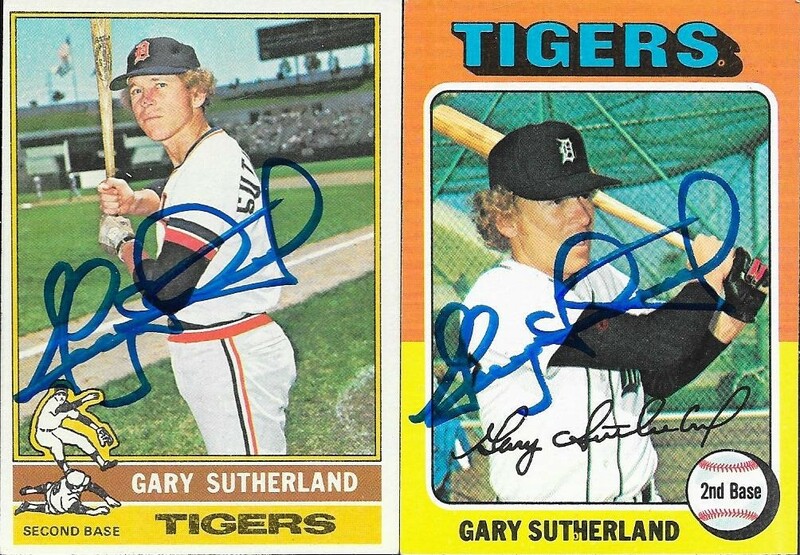 I also got both of these 1977 Topps signed. 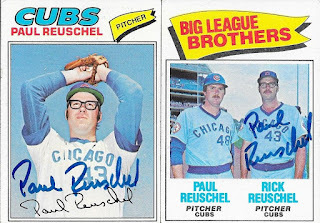 I had alreasdy received a TTM success from Rick Reuschel, but I may send the Big League Brothers card out to try to get him to sign. I'll think about it. Reuschel (b. 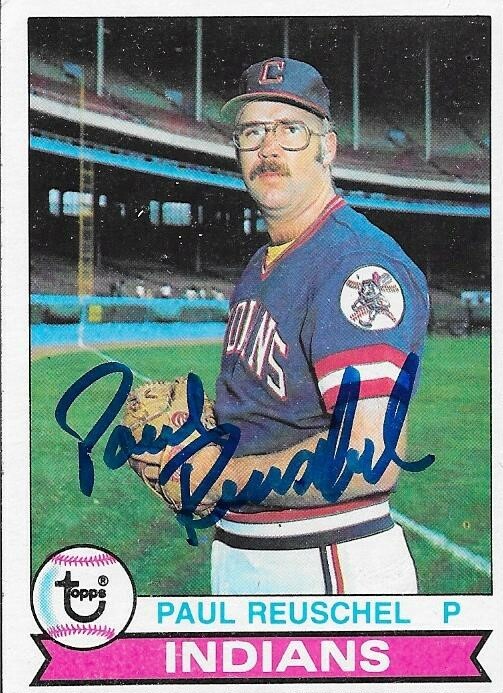 1947) played in the majors from 1975 to 1979 for the Cubs and Indians. He had a career record of 16-16 with an ERA of 4.51 and 188 strike outs. I mailed to Reuschel on March 6 and got the cards back on April 1, for a 26-day TAT.